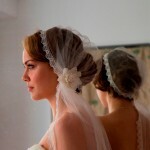 The Bridal Cap Wedding Veil is 100% HANDMADE! The veil has an unfinished cut bridal illusion tulle edge. It will complete your bridal look without competing with your dress. The cap is securely placed with two 1.5″ silver, metal combs on either side. As a bride I chose not to have a veil – now I wonder why?! (although I still adore my deco inspired asymmetric hairband!) The incredible Vera Wang says “The wedding veil is at once sacred and seductive“ and I couldn’t agree more – especially some of the glorious veils I came across, they would simply be the crowning accessory for any vintage inspired bride!